I have an issue with select boxs. When i place select input field inside a col-sm-3 it won't show right side border. It work on other grid sizes. Only Mozilla has problem all other browser everything work well. 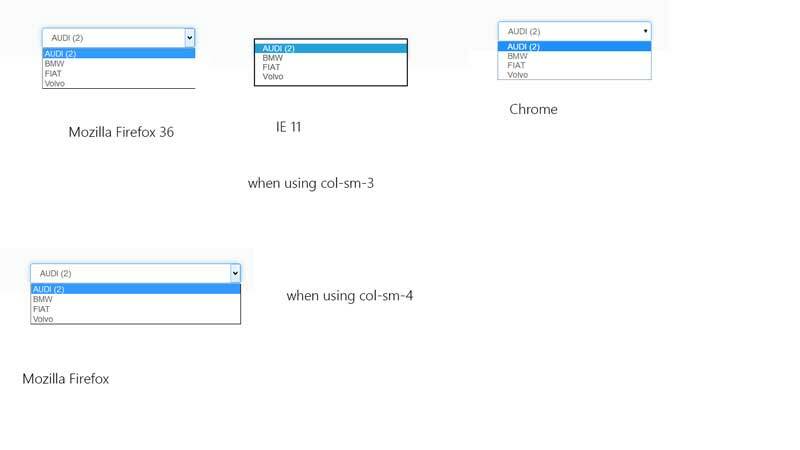 @sibinx7 What version of Windows? Can you confirm that this is a problem with the latest version, v3.3.2? I had changed version but still i have same same issues. Got a minimal test case/jsbin example? Update : I remove form-control class and gave 100% for select tab, i use col-sm-3 and row classes and got same issues, then i removed all bootstrap elements and gave 30% width, float left and margin to select tag and work well on all browser. Please check 1230 X 768 , 1366 X 768 , 1290 X 768 , 1346 X 768 etc.. Please check on these resolution. ah, i had to force my monitor to accept 1366x768, and now i can see the issue in Firefox. however, as soon as i move the Firefox window slightly, the border appears. This leads me to believe it's a bug in Firefox's rendering engine and the slightly unorthodox resolution used (a more standard one would be 1360x768. 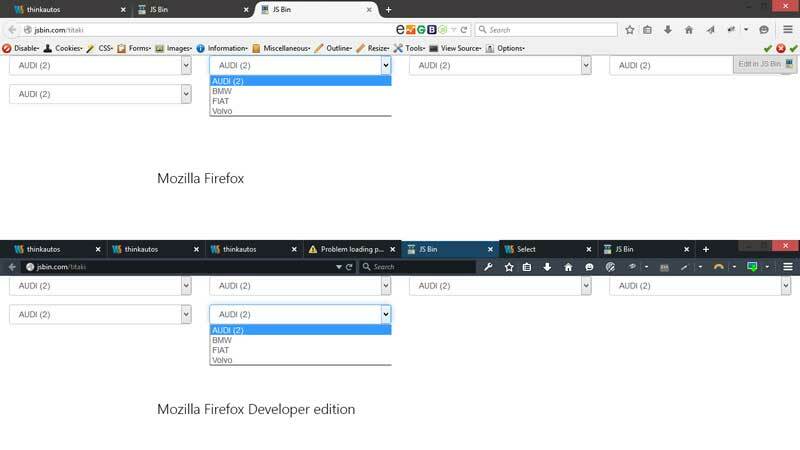 Other browsers are also fine using 1366x768, so it's definitely something broken with Firefox itself, which unfortunately is outside of our control. Belatedly added this to the Wall in #18448. Upstream bug was closed as a duplicate of an existing bug.